The Glass Mountains are famous for silicified fossils of Permian age, such as this Brachiopod. 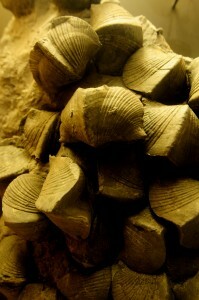 Unique build-ups of fossil shells, both wave-generated accumulations of dead shells and massive brachiopod-dominated reefs, produced by the complex interactive growth of millions of marine invertebrates that occur in the Glass Mountains. Fossils from the Glass Mountains are of special interest because of their level of detail. Blocks of limestone from the Glass Mountains can be treated with weak acids to dissolve the limestone from the acid-resistant silicified fossils. This process often leaves unharmed the delicate spines and ornamentation found on some brachiopods and bivalves.